Designed by Elsa Schiaparelli, French (born Italy), 1890 - 1973. Worn by Vera M. White, American, 1888 - 1966. The increased interest of the couture in sports fashions designed specifically for the beach and seaside was reflected in the popularity of nautical themes in clothing, such as anchor and star embroideries, sailor collars, and flannel jackets decorated with brass buttons for summer and resort wear. 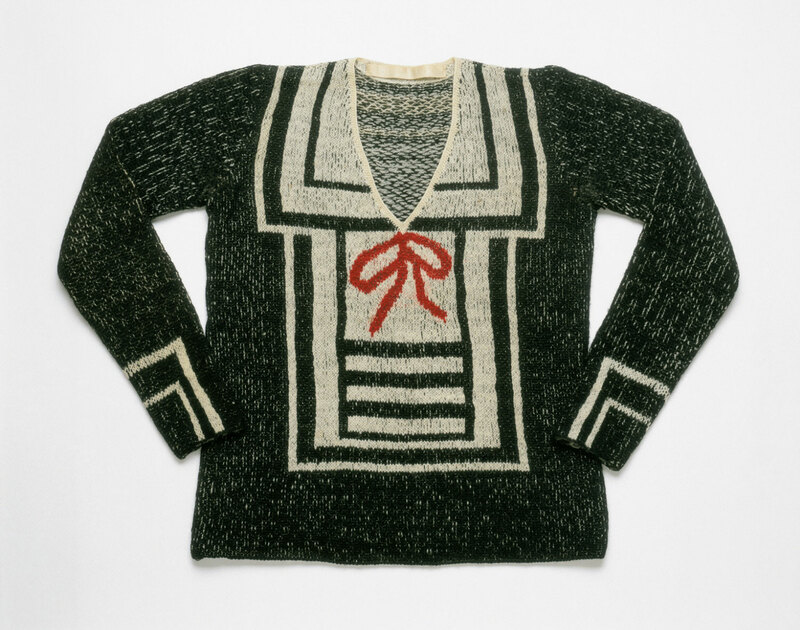 The concepts were easily adapted to knitwear, and for fall 1929 Schiaparelli included the trompe l’oeil pullover, based on a French sailor’s middy, with its collar extending across the back of the sweater. Dilys E. Blum, from Shocking! The Art and Fashion of Elsa Schiaparelli (2003), p. 24.